I have a 76 Sovereign. At some point in the past couple of months, not exactly sure when, my 12v stuff won't work if we're not plugged into "shore power" / 30AMP service at an RV park. All of the 12v lights and my new fridge which requires 12v to power the indicator lights on the front of it work, as long as we're plugged into 30amp. I took the battery to an O'Reilly's and they said it was fine, accepting a charge, etc. Though it may not be getting a charge, or only charging slowly, even when I'm plugged in as I had been plugged in for 12+ hours before I took it there and it was only at 70%. To be honest I don't even know where that would begin, so any advice on where to start looking, what to start testing, etc. would be GREATLY appreciated. My family and I have been full-timing via various modes of travel since 2008. Going on two years in our '76 Sovereign. Just replying here as I didn't subscribe for updates. Okay, so your converter, (120vac to 12vdc) is working fine as you are good to go when plugged in. That leads me to believe that your battery is disconnected. Not familiar with your trailer but on mine there is a simple rotating "on/off" switch behind the couch. In the "off" position you get exactly the symptoms you describe. Look for a fairly herky, usually round, two position switch. It may have failed or it may have inadvertently been switched off. Should be wired between the battery positive and the output of the converter. On reflection, the switch should also isolate the 12vdc when plugged in so disregard my last. I still believe that there is a simple "open" between the battery and the rig. Start at the battery and physically inspect all the connections, Pos and gnd. See if something doesn't jump out at you. 1976 AS did not have swt as stated above unless some installed one. Un plug shore power use volt meter between red wire from batt. and ground lugs black wire or as I see white wire to ammeter shunt that is ground if no reading batt. is interupted [no power] as converter is supplying 12 volt only no batt. If the battery was heavily discharged, it may take more than 12 hours to be 100% charged but it should be finished with bulk charging and slowing bringing the battery up to full charge. You may have a bad connection or an open fuse somewhere, in a place where the converter is able to provide 12v power to the trailer's systems when you're plugged in, but isn't getting current to the battery. Using the multimeter, make sure you have continuity between the fuse block and the battery. If it seems like you have continuity, check that all the connections are clean and secure. Check the voltage across the battery terminals with the trailer UNplugged from shore power, then plug in and check the voltage again. If it's the same, you're getting no charging voltage to the battery. If it's higher when plugged in, you have a different sort of mystery. For information, search "RV electrical systems" with your favorite search engine and find an article that has the right level of depth for you. They range from "how to plug in to shore power" to "how to set up your own solar system" so you may need to skim a few. There's a book on amazon available as an e-book or hard copy that I've seen recommended, but I've never read so I can't tell you if it's what you need. 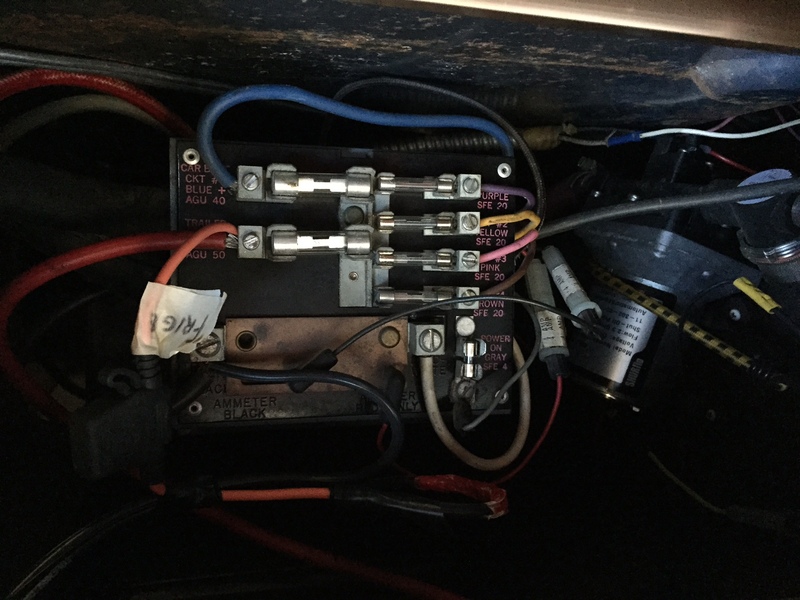 "RV Electrical Systems: A Basic Guide to Troubleshooting, Repairing and Improvement"
Look for a single fuse mounted on the skin of the trailer. It will be in the negative battery circuit. If there is one. Many coaches of this era had the negative side of the battery fused. If the fuse is blown the battery won't charge from the converter and it will not discharge either. I had a similar situation with my 1975. There was a fuse which was not making good contact in the inverter area. I cleaned the fuse and fuse holder and bent the holder prongs slightly. That did the trick. Check the continuity on the two large fuses on the panel I your photo. I hah one that looked just fine, but it was bad. It really sounds like your battery is not connected. Should be a simple fix. Indeed it was just the connection where the battery cables plugin right in the battery housing. I had checked that they were connected twice, but always put the battery back in before testing. Apparently the size of the battery was causing the cables to pop back out when I shoved it all back in. Maybe batteries were smaller in 1976. Thanks for all of your help and insight!